It’s been 20 years since Steven Spielberg and Michael Crichton brought Crichton’s novel “Jurassic Park” to the big screen, so it’s surprising that a musical theater parody would surface now. It also raises the question of whether the material is still ripe for big, juicy laughs. Marshall Pailet, Bryce Norbitz, and Steve Wargo have the right idea in retelling the story through the eyes of the dinosaurs and glomming onto the concept— a minor plot thread in the film—that several of them, all genetically engineered as females, have spontaneously turned male. “Triassic Parq” depicts the confusion among a small community of female Velociraptors and T-Rexes when one of them (Kellie Spill) begins to change. Velociraptor of Faith (Jackson Tobiska), the group’s spiritual leader, probably knows more than she lets on but decides the truth is a dangerous commodity that must remain hidden. If it all sounds somber and ponderous, the creative trio’s often outrageous lyrics, set to Pailet’s rock score, are designed to get you laughing at the scenario’s sheer silliness. And if the 15 mostly satirical songs aren’t sufficient to cue laughter, director Pailet’s cast of six delivers comedic characterizations of the dinosaurs as intelligent, articulate, and self-aware. Visual and technical elements also contribute to the show’s parodistic nature. Joe Holbrook’s faux-stone set is part “The Flintstones,” part “Planet of the Apes.” Anthony Tran’s dinosaur costumes eschew the literal to create the raw look of a jungle or war movie. Matt Schleicher’s lighting suggests a madcap disco or rave party. Ryan Brodkin’s sound, highlighted by blood-curdling reptilian bellows, also locks things into “SCTV” territory. Kelly Todd’s frantic choreography is enjoyably over the top. 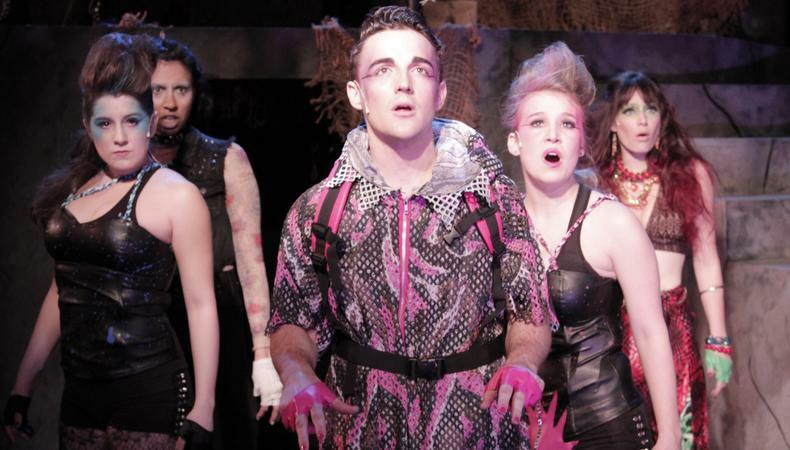 Music director Taylor Stephenson plays Pailet’s cheerfully loopy rock score with skill and confidence from an onstage keyboard while interacting with the cast under the name Pianosaurus. So why isn’t “Triassic Parq” funnier? True, humor is subjective, but Chance Theater is an old pro when it comes to zeroing in on material that spends the first few scenes softening you up for the kill, then gets you coming and going until you’re helpless with laughter. But it’s not happening here, though the evening does have its moments. Most of the lyrics are genuinely inventive. Visual gags, such as little goats getting their heads ripped off by dinos, abound. Alex Bueno’s Mime-a-saurus character, rooted in absurdly funny expressions and gestures, is the show’s de facto star. Camryn Zelinger shines, first as narrator and guide Morgan Freeman and later as the Velociraptor of Science, who was exiled because she sprouted a male appendage. The show and its staging are pleasingly wacky and off-kilter but only fitfully funny. What’s called for is writing and direction so wild, raunchy, and skillfully humorous that we favorably compare “Triassic Parq” with “Avenue Q,” “Urinetown,” “The Producers,” “Reefer Madness,” and other great musical theater satires of recent years. Presented by and at Chance Theater, 5552 E. La Palma Ave., Anaheim Hills. Jan. 30–Feb. 24. (714) 777-3033 or www.chancetheater.com.